Stephen and Radha guided us through this interesting journey. 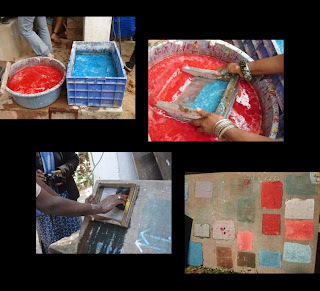 One of the main tasks was making Recycled hand made paper. The Process: The first step is to soak waste paper in water for 42 days. The beater machine then beats the waste paper along with cotton fiber. The ratio is about 50% of both. To prevent blotting, rosin and alum is added. Rosin is first diluted in caustic soda. The mold is made of fine nylon net over a frame of Burma teak. An outer frame made of normal wood is placed over the net. The outer frame gives the shape to the paper. 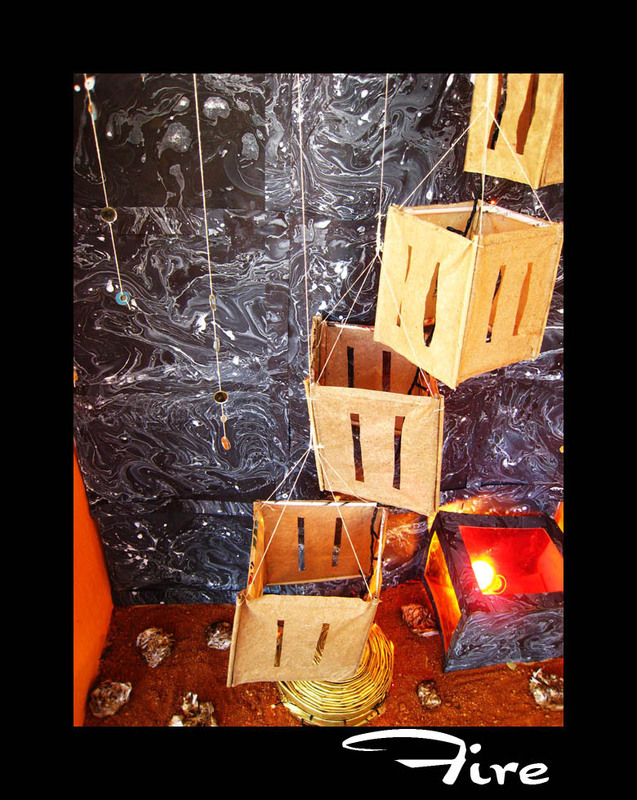 This apparatus is then dipped into the paper pulp. The pulp gets scooped into the frame and the excess water runs through the plastic mesh. After sufficient quantity of water runs out, the slightly dehydrated pulp is either put on a cotton cloth or, it is placed on a wooden board and a sponge is used to drain out excess water and left to dry. After around 100 such sheets are made, they are collected and compressed together in a pressing machine. 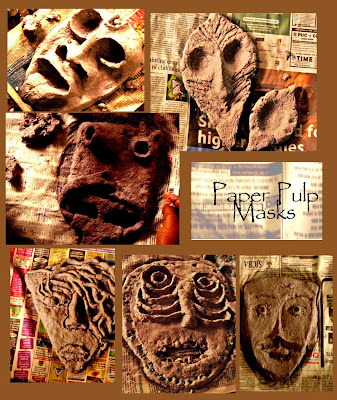 Making a mask out of the pulp was our next agenda. The paper pulp is taken and squeezed dry. Its pound to a fine substance and a glue is made using maida (refined flour + water, boiled together ) and it is mixed into the pulp. The mask is made and left out to dry. It takes a long time to dry, roughly about a week. After the mask is dry, it is painted, preferably using acrylic colours, even poster paints can be used. Since newspaper is already recycled it can’t be reused for the pulp. But we did find some good uses for it. Stephen taught us to make two types of paper bags, a folder, a bowl and a lantern using newspaper. Making the folder involved weaving of paper strips. For the bowl the paper strips were wound up till they were big enough and the center could be pushed to give it dimension and depth. Stephen also taught us how to make tissue paper flowers, folders out of handmade paper and binding. 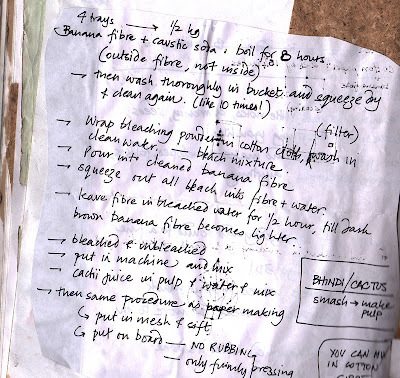 On the last day at Visthar, we made Banana fiber paper. The process is long and elaborate. The outer part of the banana stem is used. It is then boiled with caustic soda for 8 hours. For cleaning, the fiber is soaked in water and the water is squeezed out. This process is repeated several times. The fibre is bleached and put into the beater to make pulp. To provide strength to the paper, cactus or lady’s finger (okra) juice is added to the final pulp. The whole process is 3 days long. Banana paper is also used as a part of currency notes as it has excellent folding properties and it is strong. For our final project we were divided into five groups. The main theme was deforestation. 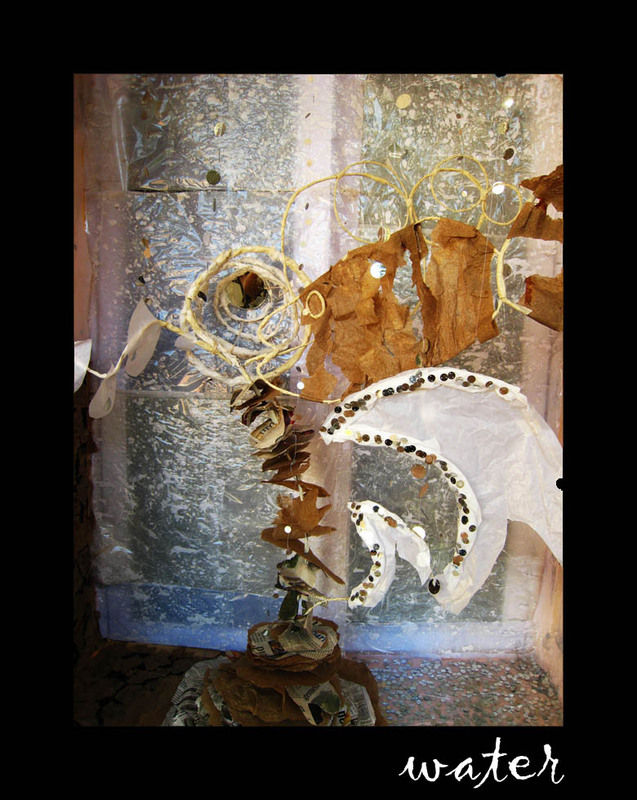 It was suggested that the groups made using paper and the tress should be based on the themes of the five elements, namely, earth, water, air, fire and ether. Our group is handled the water element. Before moving on to the final installation we had to brainstorm on the idea of presenting water through a tree. For that we first made a mind map on water so as to analyze what really water is and we came with terms and ideas we would not have thought of otherwise. After that we had to come up with ideas and designs of the final installation. 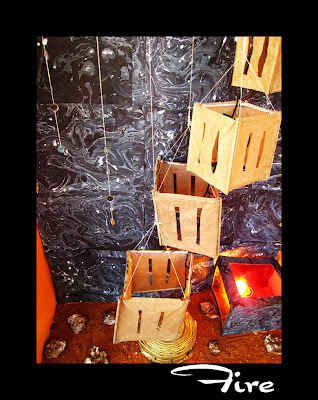 Then the final step of brainstorm was to build up a prototype of the actual installation. The only limitation set was that no colours could be used, so colored light was to be used for giving the necessary effects. 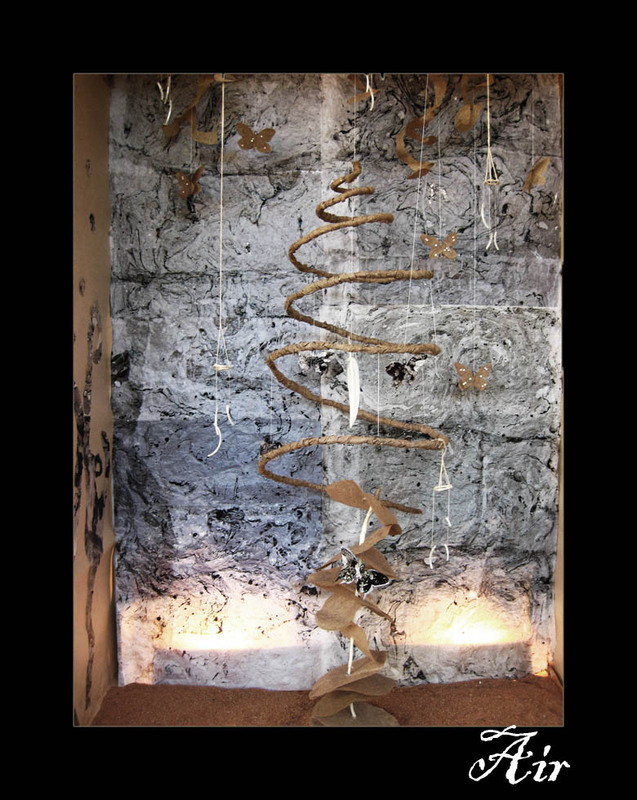 The concept of our installation was to bring out different elements of water through our tree. The wave shows the power of water, and how excess of it causes destruction. On one side of the tree there is parched land to show that lack of water is destructive as well. The placement of the tree in the middle of the wave and the parched land depicts how crucial the balance of water is. Life is shown through the fish, explaining the fact that it’s a source of life for all the living things on this planet, also that life first evolved in water. The bubbles show illusion and uncertainty and perfection, (as the water bubbles always attain a perfect spherical shape) . The receding spiral shows depth, vastness and mystery and the mirror at the end shows reflection. The flowing branches, with water droplets show the movement and rhythm in water. Going to Visthar was quiet an experience for four long days. The long bumpy bus drive from Srishti to Visthar, the dust, the honking of cars, students laughing and enjoying themselves on the ride back and forth, the hot lunch, seeing the students work with enthusiasm in papermaking and in the end the creation of the final installation..... was all worth it. 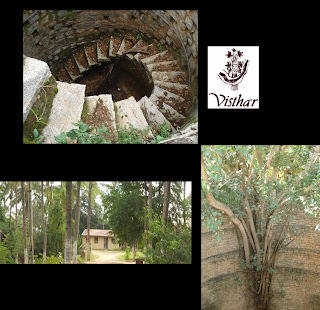 The campus of Visthar was green with many coconut, banana, mango and jackfruit trees. Everything is lush and green. There was this huge empty well next to the paper making area. The students loved going into this well and chill out. Stephen, head of paper making department was ever so gracious and kind to help and show the students more than they needed to know. Thank you, Visthar and Srishti Foundation students for making this class a great success. When we think of visthar now, we think of paper, “lots of paper” that we designed and made. 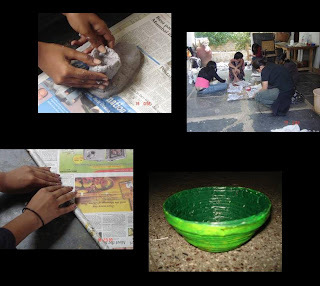 Not only did we learn to make paper with the help of Radha and Steven, but we also went a step ahead and made things with paper pulp which includes masks, and from newspaper which includes containers. 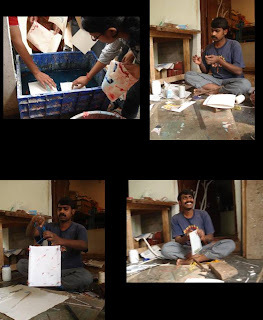 The most unusual and exciting thing we made was paper from banana fibre pulp which was mixed with cacti juice. It took a long time to make the banana pulp but it was a rare experience. 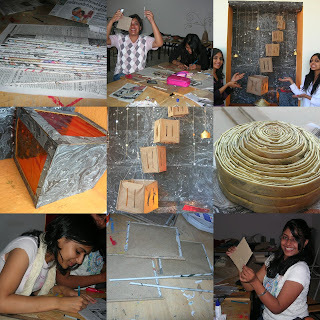 Apart from that we made paper from waste paper pulp and sprinkled whatever we wanted on the pulp-from flowers to ten rupee notes. 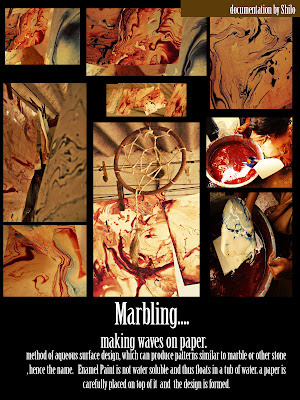 We also marbled some paper with enamel paints.Our final installation was based on one of the five elements – earth. We wanted to incorporate the good side of earth as well as what wrong man has done to it. Since we were forbidden to use color it was hard at first, as colors are the first thing you use to portray earth. In the process of making our installation we came across a lot of hitches. We had to shift our installation, a lot of stress, broken glass in a team mates foot and three bulbs not working. It was a great way to work on our patience level and our creativity. 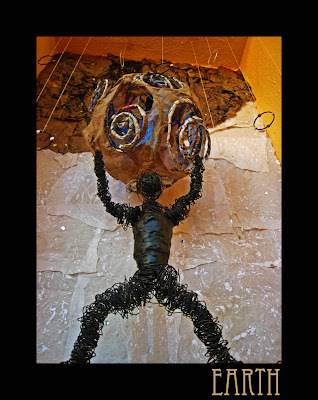 We decided to make a man out of wire and have him hold up our globe. By this we wanted to symbolize that man has a choice of either holding it up or having it under its foot. Fire, the most destructive element of them all. The Giver of Light. The Destroyer of Evil. It was quite a challenge to portray such an obviously color-rich element without any trace of color but we, as a team took to it with great enthusiasm. 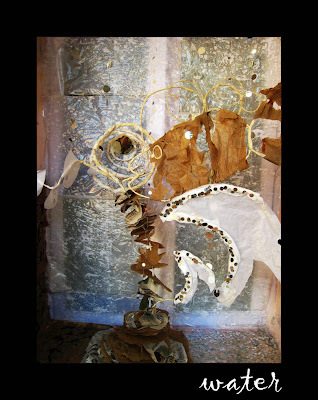 In our installation we made an attempt to merge together the constructive as well as destructive aspects of fire and as all the groups were required to operate around the common theme of a tree trunk, we decided to portray our trunk as a flame made up of banana- fiber lanterns. 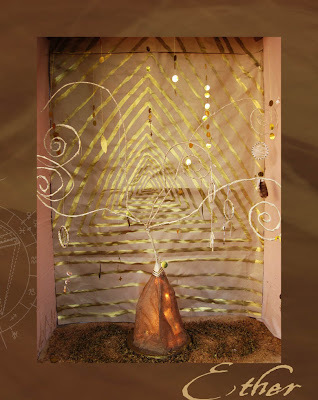 Also, the spiral manner in which we hung up the lanterns, added a sense of depth and movement to the flame. An important fact, which we made a point to take into consideration, was to try and incorporate all the new things we had learnt during the course of this workshop. So, using the newspaper bowls we had learnt how to make, we constructed a golden cone-like structure at the base of the flame to act as the point of life and origin. 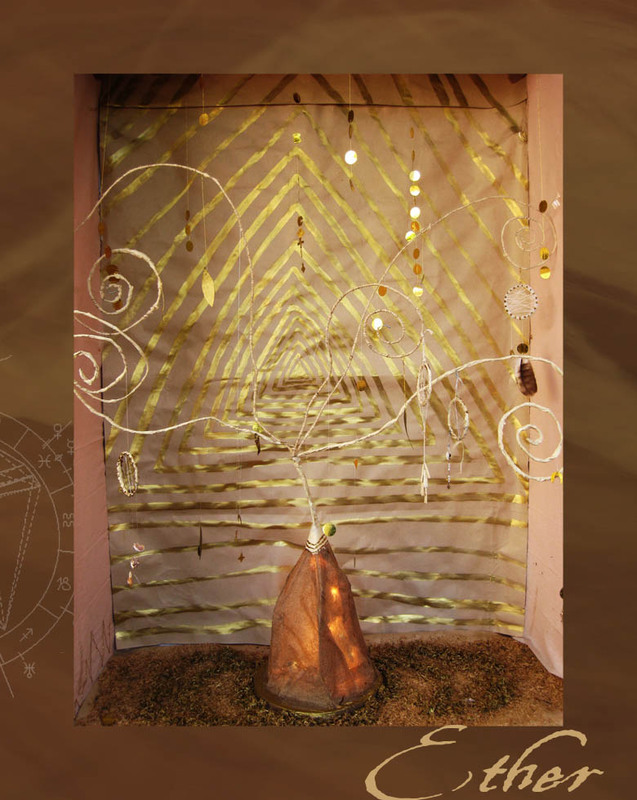 We made use of fairy lights and spotlights in and around the flame respectively to add to the effect. Mirror hangings were added to enhance the reflective nature of light. For our background we used white paint marbled on black paper so as to give a celestial and dark meaning to the installation. The burnt flowers and sand on the base were to emote that sand destroys fire , and burnt flowers end up mixing with the sand hence completing the circle of life. Looking back, we feel that this was a unique and enjoyable experience for everyone since we worked very well as a team with equal participation and more importantly equal enthusiasm! And the result is there for all to see! 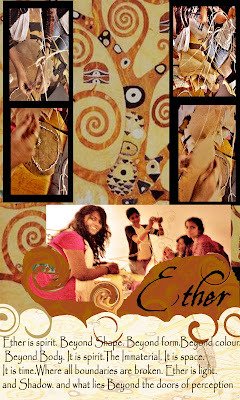 Ether is a topic we all could relate to in our own ways, which was one of the main reasons we functioned quite well as a group, with coordination, sensitivity and creativity being our anchors. We perceived ether as the soul breaking away from the material, which is reflected in the spiral symbols we used as the branches of our tree. We also designed our own dream catchers, which represents individuality. Working as a group was a new and fun experience for all of us as there was no better or worse…we all worked as a team to meet goals and dead lines and at the same time created something different yet connected. 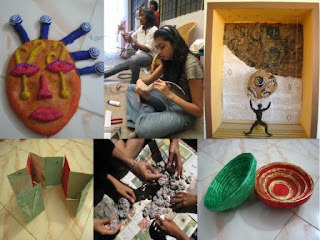 The result of a 4 day workshop at Visthar conducted by Stephen and Radha. Banana paper, bowls and binding. Cotton. Feathers found in the fields and folders. Making paper red and blue.